Ranked #1 Tour in Malaga! The Tapa is a mandatory reference in Spanish cuisine. It is a popular, out on the street custom, which reflects the living image of a traditional and flavorful history. 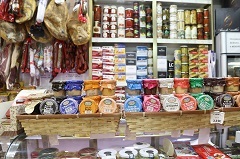 We would like you to meet small paradises difficult to get to in the culinary map of Malaga. 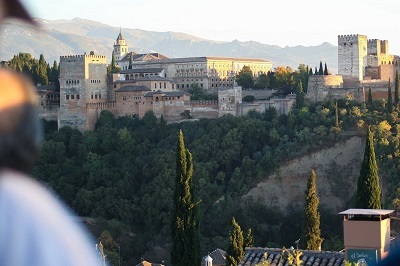 Our sherpas will take you on a 3,5 hours tapas tour that drifts away from the standard itineraries, where small artisans, grocers, and chefs will share their personal stories and their passion for food. 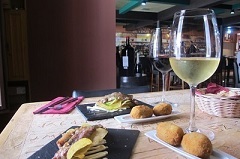 In this Taste of Malaga Tapas Tour, conceived as a type of “restaurant hopping” very commonly done in the everyday life of locals, you will savor a great variety of creative, surprising and delicious tapas in many different prestigious establishments as you you eat your way through Malaga’s old town! If you want to discover what our buzzing Atarazanas food market has to offer and try some of the best tapas in town, then this is your tour! 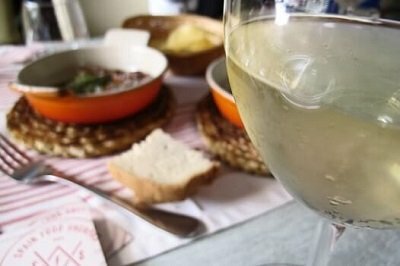 Savor delectable dishes and drinks, at the same time you learn about Malaga’s rich (food) history and culture, passing by some of its most emblematic sites and culinary hotspots. Our Tapas Tour starts with a visit to the famous Atarazanas Market, where you can enjoy its beautiful colors and flavors and experience the diverse, seasonal products of our region. 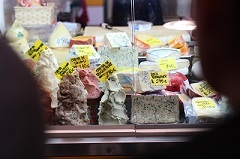 Meet their stand holders and taste some of its best produce- true locally made specialties. 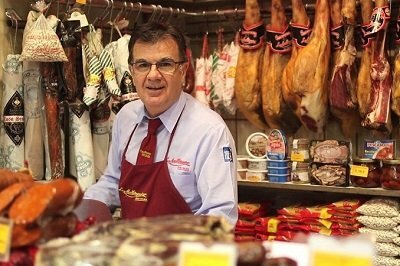 You will learn how to distinguish 3 different types of “Jamón”, including our worldwide famous and highly appreciated Iberian Bellota ham, acorn (and chestnut!) fed from Malaga. 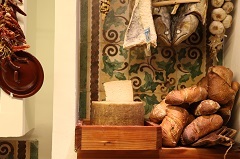 Awake your senses and enjoy this hand-cut delicatessen in a small, family-run specialty store. But not only traditional tapas reflect our local gastronomy, but also the ones with a modern twist, although always inspired by autochthonous ingredients and authentic recipes. 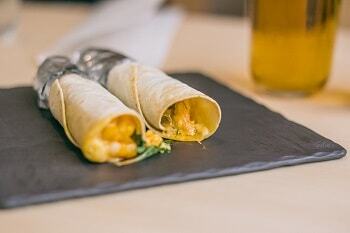 A good example is the mouth-watering Pil- Pil Prawns Wrap of our friend Willy from Uvedoble. 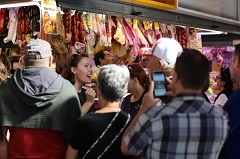 Throughout the whole tour you will be guided by a member of our team, a so called Food Sherpa, who is an expert in our culture and has intimate knowledge of the Malaga’s best-kept foodie secrets. Don’t miss this opportunity to experience the best places to eat in Malaga and to discover hidden gems that even locals don’t know about! 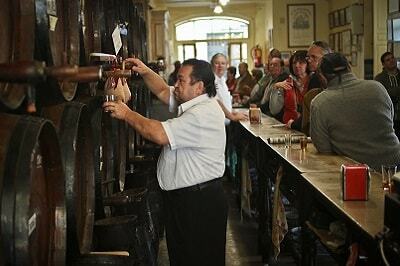 And at the end of the tour, your guide will give you our exclusive Malaga Dining Guide, with all our favorite places to eat and drink in Malaga put on a handy map. 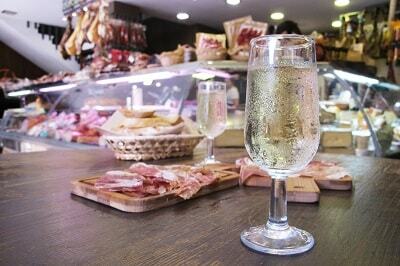 Why our Taste of Malaga Tapas Tour? 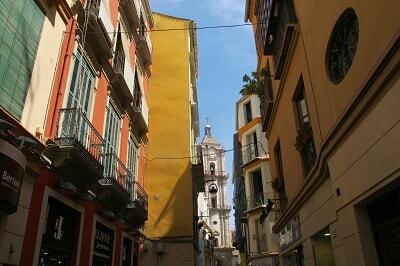 It’s a fascinating journey through the history of Malaga’s gastronomy. 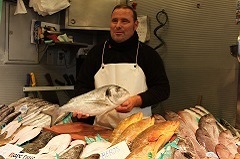 From fresh produce in the market to traditional dishes or even modern day, contemporary delicacies. *Because we work with family-run businesses tour stops and tastings may change slightly to reflect seasonal produce and availability.